Available in 5 new stylish and long lasting color finishes (Black, White, Blue, Red,Green). The Kroma-A international edition includes the amazing Crios Tank! The Crios tank delivers huge flavorful clouds at 55W with an upgraded, easy to top-fill, design. 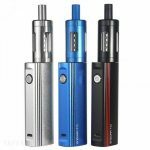 Experience a world of difference and upgrade your vape with the Innokin Kroma-A!